Besides a swarm of heavily armed operatives of the Department of State Services (DSS), the Nigerian Army and Police Force, President Muhammadu Buhari’s visit to Jigawa State today will be secured by an additional 2,000 personnel drafted from the Nigeria Security and Civil Defence Corps (NSCDC). “The Jigawa State command has fully prepared towards the two-day visit of the President. 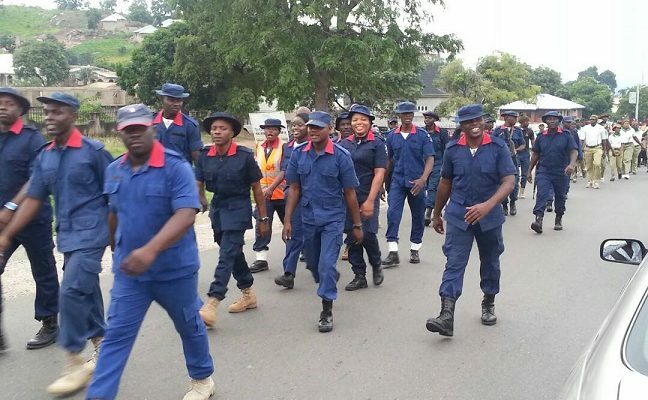 It is deploying about 2,000 special tactical operational squad and intelligence officers drawn from the state command and neighbouring formations in Kano and Bauchi States to assist in the provision of security,” said NSCDC spokesman in the state, Adamu Shehu. He explained that the personnel would be stationed strategically in the places Buhari would visit. Officers would be deployed all over the state for intelligence gathering and reporting, to complement other security agencies, he said. Omobude said the security challenges in the nation require urgent and proactive solutions. According to him, restructuring is not out of place, “if it will give us a safer, equitable and just society.”He also blamed the insurgency in the northeast on lack of formal education. “Education is the easiest way of developing the mind and the society. The insurgency is as a result of the neglect of education, especially in that region over a long time. I believe government should pay more attention to the education of the Nigerian child, no matter where they are. Government has made some efforts, but it should improve on the security situation and encourage parents to send their children to school,” he said. In a related development, the Nigerian Air Force (NAF), yesterday, deployed 150 special forces personnel to its newly established 23 Quick Response Wing (QRW) in Nguroje, Sarduana Local Government Council, Taraba State. The troops are part of an ongoing NAF policy to build a robust military capable of responding effectively to Nigeria’s security needs.Other Quick Response Wings in the North Central region are located in Doma, Nasarawa State and Agatu in Benue. The Chief of Air Staff, Air Vice Marshal Sadique Abubakar (represented by the Director of Operations, NAF Headquarters, Napoleon Bali), told the troops in Jalingo before their departure to partner related agencies to support Taraba in containing insecurity. “Let me use this opportunity to reiterate the need for you to be professional in discharging your duties. You must always abide by the Nigerian Air Force Code of Conduct and Rules of Engagement, as well as the Laws of Armed Conflict. I, therefore, urge you to consider it as a rare privilege to be part of the pioneer troops to establish the unit,” he added.